The Sabres’ season hinges on this 15-day stretch. Realistically, they need to win five games or earn at least 10 points if they want to stay in the thick of the Eastern Conference playoff chase. They get their first opportunity tonight against South Buffalo’s Patrick Kane and the Chicago Blackhawks. Entering Thursday’s games, the Sabres trailed the Columbus Blue Jackets by three points for the Eastern Conference’s last wild card spot. After years of dreadful home records – they haven’t finished above .500 since 2011-12 – the Sabres have established themselves as a heavyweight again, going 14-6-3 through 23 tilts. They’re on pace for their best home campaign since 2009-10. Remember, the Sabres won 11 home games all of last season. At times, their exploits this year have ignited the normally quiet crowds, making KeyBank Center feel raucous again like in the post-lockout days. That has gone a long way toward making it a building opponents detest visiting. Some elite and middling opponents are coming to town. The Blackhawks, for example, have fallen apart this season, dropping to last in the Central Division. Their slow start cost coach Joel Quenneville his job. Age and a weak prospect pool have caught up to the Blackhawks, who won three Stanley Cups from 2010 to 2015. Some of their core players – most notably defensemen Duncan Keith and Brent Seabrook – are graying. A concussion has limited starting goalie Corey Crawford to 23 games. Years of trading high draft picks to gear up for the postseason has also hurt them. Despite a career-type year from Kane – the dynamic winger has compiled 29 goals and 71 points in 50 games – the Blackhawks have mustered only 18 wins and 45 points. After the Blackhawks, the Sabres play the Minnesota Wild (third in the Central) on Tuesday before the Carolina Hurricanes (fifth in the Metropolitan) visit next Thursday. The Sabres haven’t beaten the Hurricanes, whose playoff drought dates back to 2009, since April 6, 2015. Incredibly, the Sabres have lost 10 straight games to the Hurricanes. The Sabres face the Detroit Red Wings (seventh in the Atlantic) on Feb. 9, the first part of a back-to-back afternoon set that concludes with the Winnipeg Jets (first in the Central). 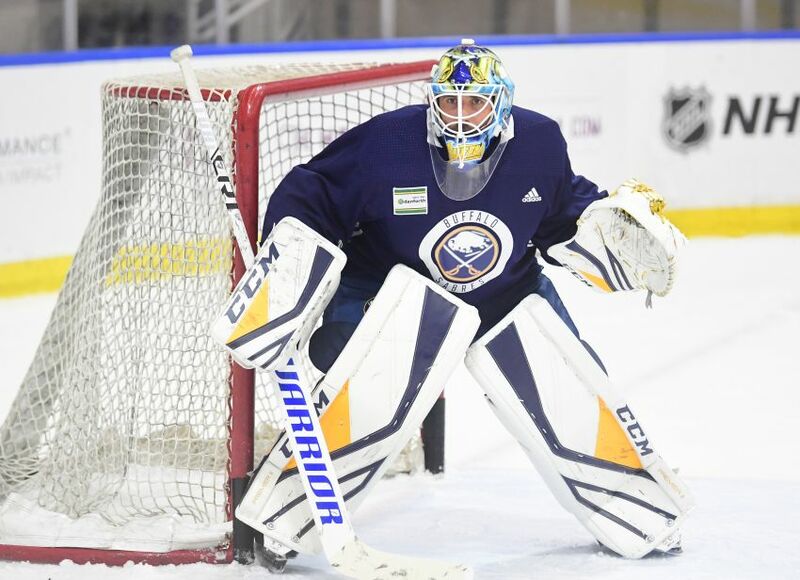 The upstart New York Islanders (first in the Metropolitan) and former Sabres goalie Robin Lehner make their final trip here this season Feb. 12. The home stand ends against the New York Rangers (sixth in the Metropolitan) on Feb. 15. How rare was it for veteran Sabres winger Jason Pominville to be benched for a game? Prior to sitting out Wednesday’s 1-0 loss in Dallas, Pominville, 36, hadn’t been a healthy scratch with the Sabres since April 4, 2006, way back in his rookie season. To replace Pominville against the Stars, Housley inserted winger Remi Elie, who had sat out seven straight contests. The Sabres claimed Elie, 23, off waivers from Dallas before the season. After a torrid start in which he seized his opportunity on the top line beside NHL All-Stars Jack Eichel and Jeff Skinner, Pominville has cooled off, compiling only two goals and three points in the last 24 games. Overall, Pominville has scored 10 goals and 20 points in 44 outings. Housley also dressed Nathan Beaulieu on Wednesday, just the defenseman’s second appearance in the last 10 games. To create room, Housley sat out defenseman Matt Hunwick, who returned for Tuesday’s 5-4 win in Columbus, his first appearance after being scratched 13 straight games. “These guys have done a terrific job of handling these situations well, and I know it’s not easy, particularly the guys that have been sitting out long periods, stretches of time, Matt Hunwick and Remi Elie,” Housley said. Notes: The Sabres had Thursday off. … The Sabres, who won 10 straight contests in November, haven’t won consecutive games in regulation since a three-game winning streak from Oct. 20 to 25. … The Florida Panthers waived former Sabres winger Jamie McGinn on Thursday. McGinn, 30, hasn’t played yet this season after undergoing back surgery.